Today is the Winter Solstice, the start of the winter season. Parliament's Christmas/New Year recess commenced on 20 December and lasts until 7 January. With just 98 days to "Exit Day" there is, as yet, no acceptance by the House of Commons of the Withdrawal Agreement and Framework for the Future Relationship - ("the deal"). A House of Commons vote scheduled for 11 December was deferred by the government until the week beginning 14 January 2019. The Prime Minister told the Commons that further discussions were taking place with the EU to seek additional reassurances over the Ireland/Northern Ireland backstop. The UK government has not ruled out a no deal Brexit and, in fact, has been preparing for it for some time - see post 7 September 2018 Operation Yellowhammer. Preparations have now been stepped up - Previous post. On Wednesday 19 December a further "emergency debate" was moved by Sir Keir Starmer QC MP (Labour and Shadow Secretary of State for Exiting the EU). The debate was granted and provided an opportunity for MPs to express their concerns over the government stepping up no deal planning and the considerable monies put aside for that purpose - (£2 billion according to the government). The debate may be read at Hansard 19 December. MPs expressed strong views that a No Deal Brexit ought to be ruled out by the government. Sir Keir Starmer said - "I really think it is the duty of the Government and the Prime Minister to stand at the Dispatch Box and rule out no deal." It is foolish to make predictions but most of the political indications are that the Commons will reject the deal. 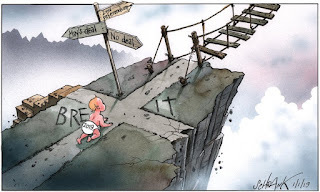 Rejection of the deal will make a no deal exit from the EU much more likely and there is no obvious well-considered alternative strategy . In any case, by the time of the Commons vote there will be just over 70 days remaining until Exit Day. Precious little time to secure agreement with the EU on any alternative withdrawal agreement even if the EU were prepared to negotiate further. For a view that the EU might negotiate further see The Guardian 8 December. 1. Parliament accepts the deal - (perhaps with further clarifications or reassurances). The Withdrawal Agreement will proceed to ratification and will enable the transition period to commence at the end of March and negotiations to be opened on the future relationship. The EU has expressed its readiness to enter into negotiations immediately. The cliff edge feared by business will have been avoided. The transition period (or implementation period) will last until the end of 2020 (with a possibility of extension). Acceptance of the deal will be followed by a European Union (Withdrawal) Agreement Bill to give effect domestically to the Withdrawal Agreement. For further discussion see the UK in a Changing Europe publication "The Brexit Endgame"
This requires the government to publish, within 21 days of the vote against the agreement, a written statement setting out how the government intends to proceed in relation to negotiations for the UK's withdrawal from the EU under Article 50(2) TEU. If the Commons were to reject the withdrawal agreement on (say) 16 January, the statement would be required by 6 February. Following the publication of the statement, the House of Commons is then to consider a government motion - expressed "in neutral terms" - section 13(6). This motion must be moved by a Minister of the Crown within the period of seven Commons sitting days beginning with the day on which the statement is made." By now we could be in mid February ! This will provide an opportunity for further debate but perhaps little more. Given existing House of Commons procedure, via which the government controls most of the business, it is difficult to see how MPs will be able to force the government into any particular course of action. (b) Seek an alternative deal - assuming the EU is willing to negotiate further, seek some other deal even though it is far from clear what. (b) would necessitate an extension of Article 50 to allow further discussion / negotiation with the EU. Such an extension is not guaranteed since it requires unanimity in the EU Council. It is thought that the EU would agree to a modest extension for good reason such as to allow time for a further referendum. An extension would raise the question of whether the UK should participate in European Parliament elections to be held 23-26 May 2019. A new European Parliament will commence on 2 July 2019 and there ought to be UK MEPs if the UK is still a member of the EU at that time. (c) is problematic given the 2016 Referendum Leave vote. It could be reversed if another referendum were to reverse the first but this raises the obvious political problem that those who voted leave and still wish to leave will feel cheated of their prize. Legislation is required to put any further referendum in place and that is also likely to require an extension of Article 50. The government has, at least so far, been adamant that there will not be a further referendum. Brexit could also be reversed if the government were to change its policy and if Parliament agreed. This course of action is discussed by Professor Phil Syrpis at LSE Blogs - The Time has come to revoke Article 50. It appears to require the government to bring a proposal to Parliament. It also appears that legislation would be necessary to end the Brexit process - e.g. to repeal the European Union (Withdrawal) Act 2018 etc. Such legislation need not be lengthy and could be enacted quite quickly but only if the political will was there. It is clear from the Wightman case that the UK may, as a matter of EU law, revoke its Article 50 notice. The judgment of the Court of Justice of the EU is discussed in this previous post and, following the CJEU judgment, Scotland's Court of Session has issued a declarator in line with the CJEU's judgment. So, as winter arrives, the debacle is before us. The deal has not been accepted and its rejection appears likely come the January vote. "No deal" is thus more likely even if MPs do not want it and, so far, it has not been ruled out by the government. There is no clear alternative strategy if the deal is rejected and time is running out. The damage caused to the economy has already been large and further damage continues in the light of the indecision and uncertainty. The evidence (e.g. here and A below) is that a no deal Brexit will be devastating economically and, for all the preparations, can only be mitigated to a limited degree. 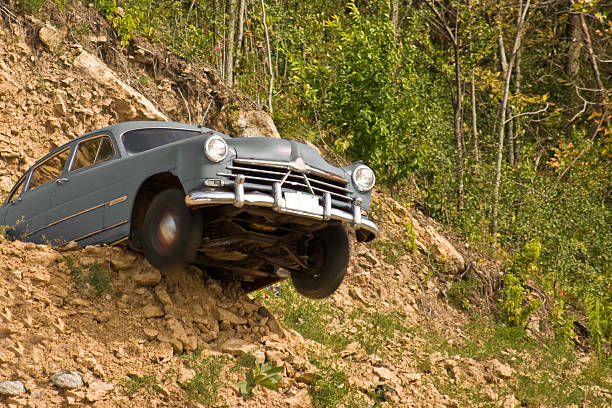 The UK is like a car on the edge of a precipice and a move in the wrong direction by one the unfortunate occupants will tip the car to catastrophe. Perhaps over the festive season MPs of all parties will reflect on just how much damage to the UK they are willing to sign up to and be responsible for. What would be the UK's constitutional requirements to revoke Article 50? What happens constitutionally if the draft Withdrawal Agreement is voted down? "The stepping up of ‘no deal preparations’ is being presented by the government as a matter of responsibility. In fact, it is perhaps the most wanton act of irresponsibility embarked upon by any British government in living memory. It is presumably a political ruse to encourage MPs to vote for May’s deal – and it may well succeed in that – but it carries huge costs."